Bought Ali Edwards first book yesterday and got inspired by her style for my latest layout! Used the sewing-machine this time. The pictures of Zander are taken in the same month as the pictures I used for my previous layouts. I love these pictures of him! He was such a busy boy that day and had lots of fun with the sand and the water. On one picture there's this boy sitting behind him: that's his cousin Niek! They get along very well. Supplies: pp Polkadots (K&Company), Pheobe (Basic Grey), cardstock (Pipoos), rub-on words (Scenic Route), letterstamps (Sirius hobby), letter Z rub-0n (One heart one mind), circle stamp (by Danell Johnson), distressink, acrylic paint burnt carmine (Folkarts), letter stickers (market). wow! 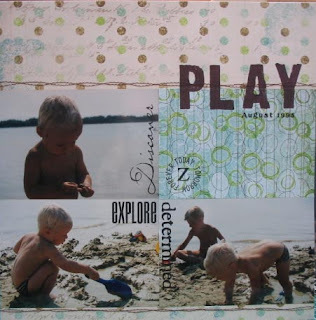 you have been busy scrapbooking, girl:) love the layouts. i bought ali's second book. love it. that girl is so talented! i checked out your scrap room too. i love it. much tidier than mine...lol.